Let’s say you’re running a bank. You need to get some new customers signed up for checking and savings accounts so that you have more money to lend out for mortgages and the like. How do you get those new customers? Well, one option would be to offer better interest rates, or perhaps lower your fees, and then advertise those things. However, those things are going to cost your business at least $30 a year (and likely more). Another option? Promise everyone who signs up for an account a shiny new toaster! Or a blender! Or something else like that! It costs you maybe $20 a pop, and if they accept the offer, you can throw on another restriction where they have to keep a certain balance for a while or pay a fee. If you go that route, you’ll get some new customers and some of them will stick around just because your bank is now the bank of choice for them. You don’t have the “upkeep” cost of no fees (which would cost you some every month) or better interest (which would require you to pay out more every month). Your cost – the cost of a toaster – is already paid for. 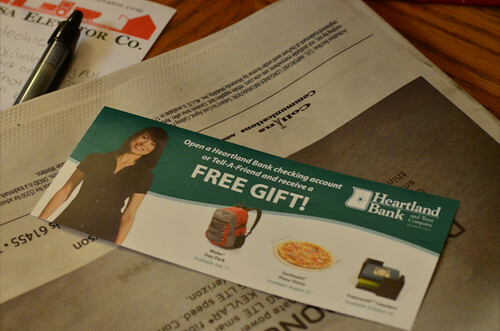 To put it simply, banks don’t give away freebies for signing up for their account just because they’re nice and want you to have a cool item. They do it because it gets people in the door and signing up for that account, and it’s often cheaper to do it that way than it is to actually improve the account in any significant way. So what should you do as a potential bank customer? Ignore the freebies. Instead, compare the bank offerings based on other things, such as monthly fees, ATM network size, availability of online banking, bank hours, and interest rates. The only time a giveaway should matter is if you’re looking at two virtually identical accounts. This giveaway rule is true for any kind of financial account. When I was in college, there were always credit card companies on campus trying to get people to sign up for a card. They’d offer t-shirts, sweatshirts, frisbees, and countless other things to get people to sign up for their credit cards. Twice, these tactics drew me in. I signed up for one in exchange for a t-shirt when I was first starting college (in fact, it was my first credit card). Later, I signed up for one in exchange for a frisbee. Thankfully, with the latter card, I never used it (much). The first one, though, started me down the path of credit card trouble that would haunt me for a decade and leave me paying bills for years after that. If I wanted a credit card, my approach should have been to study various card offers and sign up for the one that offered the most benefits to me as a college student, perhaps one that offered me a discount on gas or maybe a discount on my textbooks in some fashion. Instead, I wound up with cards that offered no benefits. But I had a frisbee and a poorly made t-shirt! Just ignore the freebies. Very rarely does the freebie have any significant value at all, at least not in comparison to the relative quality of the account you’re signing up for.